PEK comes in several types. Original PEK (picture on left) and Fruit of the Groomer PEKs. Black Cherry, Pink Grapefruit, Orange, Mint, Ginger/Elderberry and Passion Fruit. 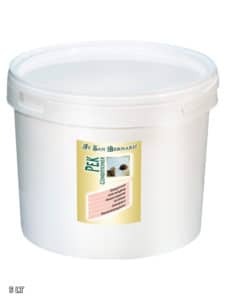 Original PEK comes in 3 sizes 250ml, 1000ml and 5000ml bucket for large projects. PEK conditioners are the most amazing de-tangling conditioners. Created with pure vegetable collagen it is safe and effective in several applications. While you may use PEK straight on the hair and mixed into the conditioning step of the bathing process, you can also dilute, heat and mix PEK to get serious de-tangling powers!! Create a Hydration Spray! Hydration spray, de-tangler, additive for extra hydration in the conditioner stage of the bath process. Directions: Mix 1/2 cup Pek and enough hot water to equal 32oz is a good solution that can be used as a spray to preserve hair while brushing, hydrating finish spray and a spray used on a damp coat before fluffing. It is best to measure PEK and water into a large plastic bowl and whisk together (plastic whisk) before putting it into the sprayer container. This will discourage separation of product and water. USE PURE! PEK can be used pure by pushing the product with a small amount of water directly into the mats or tangles. Let sit for 10 to 30 minutes. This allows the PEK to “fill” the open places in the hair shaft and let the tangles be combed out more easily. You may also dilute PEK with water to make a hydration spray. This spray can be used before, during and after…all stages of grooming. BUY FRUIT OF THE GROOMER PEKS HERE. ©FAQs and recommendations are copyrighted and property of Iv San Bernard USA. DISCLAIMER: Any recommendations given are not meant to replace the medical care or diagnostics of a licensed veterinarian. These are recommendations based on the description provided by the owner and/or pet skin care provider/groomer. In all abnormal pet dermatological situations it is highly recommended to have an examination and diagnosis by a licensed veterinarian prior to any treatment. Some skin and hair problems can be a result of an internal or deep dermis condition that should be diagnosed by veterinarian. Iv San Bernard USA accepts no responsibility or liabilities resulting in the improper or inappropriate use of their products.DISCLAIMER: When creating sprays and lotions outside of the manufacturers original packaging, it is highly recommended to label the containers with details of the product and contents while heeding OSHA and the prevailing laws of your area. Iv San Bernard accepts no responsibility for products compounded or re-dispensed or sold in unoriginal packaging.